I just realized it may be a moot point for me, I had my degraded 2011 cells replaced with ones from a 2013 pack (same open can style as the one I purchased). Granted they didn't officially switch chemistry until 2015. So exactly as Mux found, the extender pack (in my case using LCO chemistry) delivers most of its energy toward the end of the discharge curve, which means it is providing a majority of the power towards the end as well. Just between turtle and dead, the extender pack took the maximum proportion, about 58.1% of the total current, meaning it would have had to provide 159A, which is way more than the 26A rating of 2 Swing 5300 cells in parallel. Basically, this limits the minimum extender size to at least 12-13p, or ~17.3 kWH usable for this model of cell! Taking the calculation for a higher drain cell, the LG HE4 (which I should be getting samples of in the next day or two), the minimum extender size drops to 8p, or ~5.4 kWH usable. The charge curve is nearly the inverse, with some bumpier behavior at the start of the curve. In charging, the BP cells took a maximum of 52% of the charging current, which again would be an issue in DC fast charging, limiting the minimum pack size to 6p of the Boston Power cells, or 16p (~10.9 kWH usable) for the LG HE4 cells, in order to take the ~65A that would be coming from the charger. Early conclusion from this data; it's better to go with hybrid or EV batteries that are already sized/designed to take such large charging/discharging powers, if using a cell chemistry other than LMO. Otherwise, you can use "standard" Li-Ion cells but you will be building a very large pack (at least 11 kWH sized), and we still have the SoC estimation problem to resolve. Thanks for sharing that, jkenny23! Just one note: all 24 kWh batteries to date have the same chemistry, Cathode Active Material is LiMn2O4 (or LMO) with a pinch of LiNiO2. The only upgrade in "Lizard" was the electrolyte. Mux, how is that CAN translator coming? 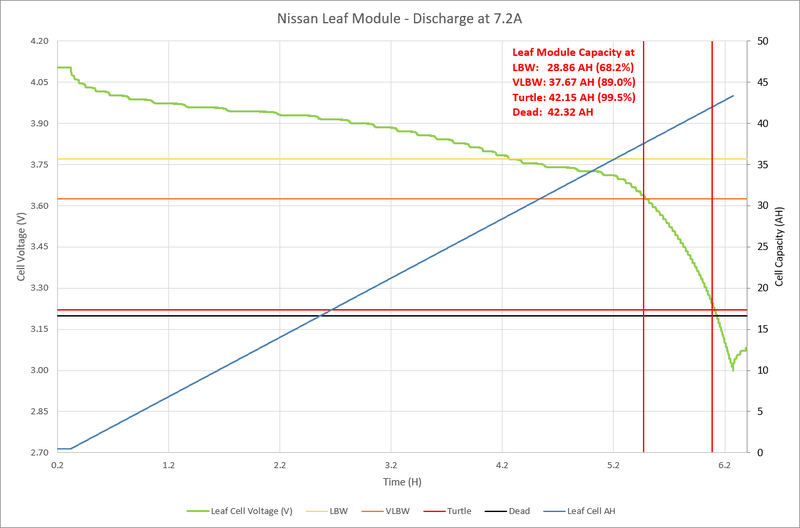 This pack fares much better with the voltage curve of the Leaf, utilizing up to 95% of the "full" capacity from 4.11 to 3.0V by the time the Leaf reports dead (3.2V/cell). Still, just over a third of the capacity is delivered between VLBW and turtle. 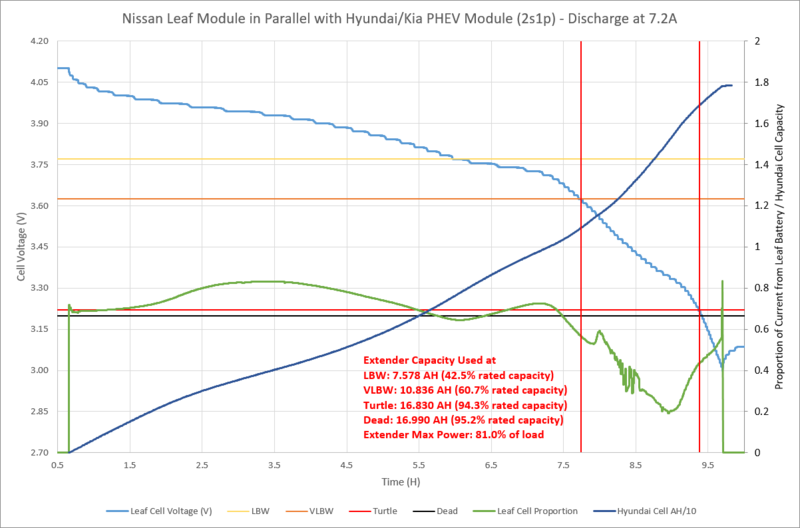 Also of concern, at peak, the Hyundai module provided 81% of the load current, meaning it will deliver up to ~72.9 kW peak, a bit higher than the pack's 68 kW max discharge spec. The extender takes a maximum of 68.1% of the input current, which is no concern since the pack is rated for 54 kW charging (more than CHAdeMO can even deliver in total to the Leaf). 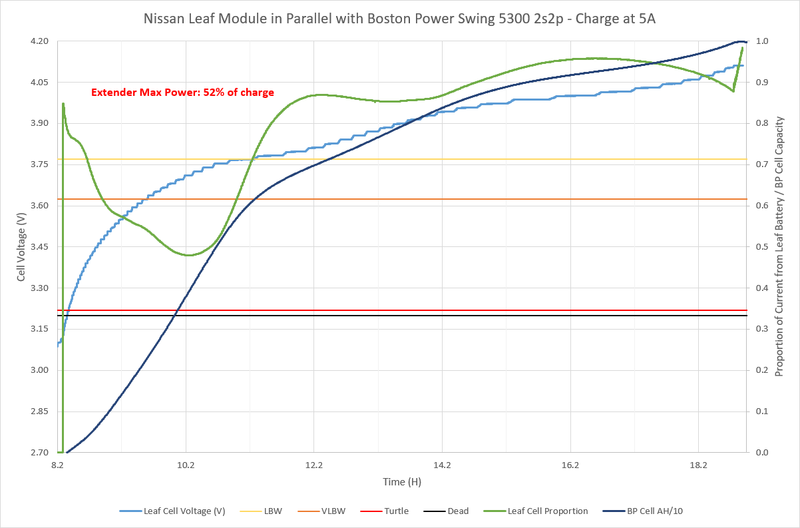 Finally here's a "baseline" of the Leaf module by itself. Capacity is 42.15 AH from 4.11V to 3.2V (dead). 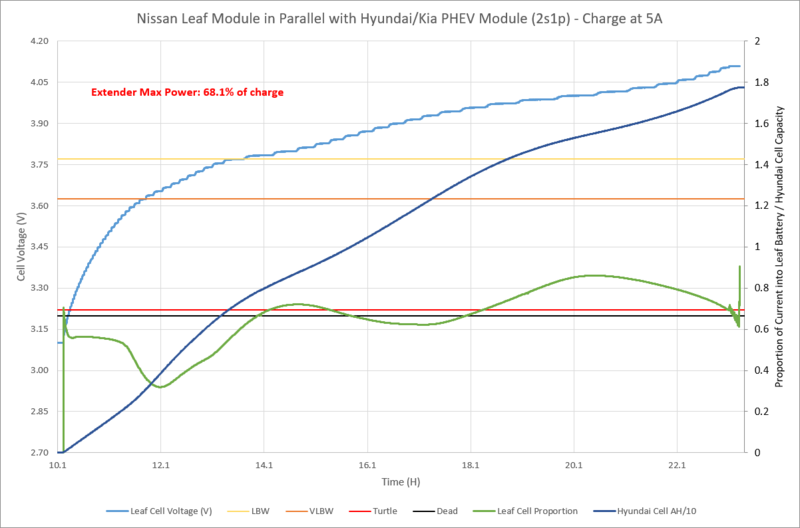 With the Hyundai module in parallel, this number increased to 63.52 AH (+50.7% capacity). 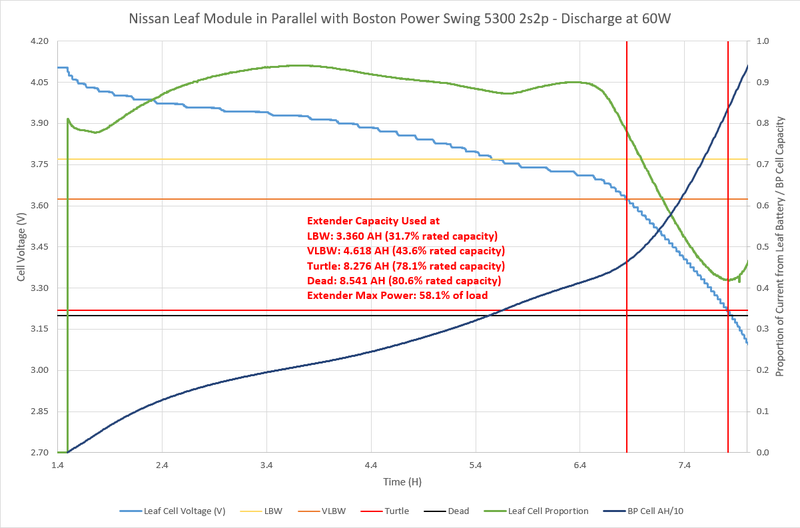 Currently I am running a test with all 3 in parallel (Boston Power Swing 5300 in 2s2p, Hyundai PHEV module, and Leaf Module) to see how easy it is to add capacity in smaller 18650 packs later once the initial ~10 kWH high power extender pack is installed. RNM wrote: Mux, how is that CAN translator coming? Just got the boards in, now I 'just' have to program them. Expect an update at the end of may. Hey mux, how much capacity mis-match between modules do you think is tolerable? I have only tested 2 modules so far, but they are coming in at 21.79 and 22.40 AH. I've got one spare module so I can pick the best 12/13 in case there's an outlier, but since these are all from different packs/vehicles there may be some large differences between them. 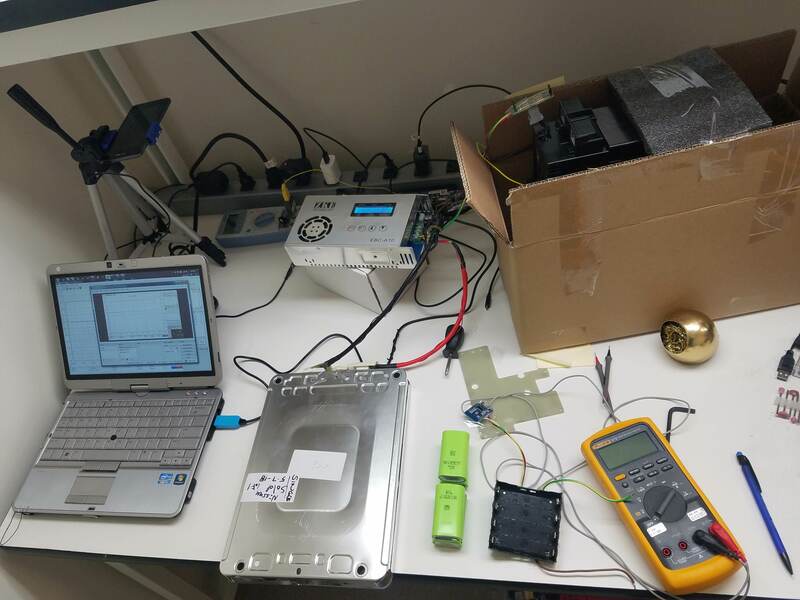 Have you done any manual measurements of your modules to see how the voltage drift is over time between them? That is not a normal mismatch, that sounds like heavily used modules. Typically, at beginning of life cell mismatch in a pack is at most a couple tenths of a percent.